We’ve all heard these excuses before, even if you don’t drive the big rigs. Long days hauling can leave you especially tired, and unwilling to exercise. However, with these three exercises, you can keep yourself fit and healthy on the road! Push-ups – When you are pulled over on a pit-stop, you can always bust out a few sets of push-ups. This keeps your body engaged and your mind sharp for when you are putting in the long hours in the driver’s seat. Tricep Dips – Again, these exercises are not to be performed when you are in the driver’s seat, but when you are parked at a truck-stop, you can always use a bench or even your truck for some tricep dips. Combining tricep dips with push-ups can be a great way to stay in shape. Resistance Band Rows – Resistance bands are portable workout equipment. You can perform a variety of exercises with resistance bands. Using your truck as a prop you can do resistance band rows. Interval Training – Next time you’re taking a break at a truck stop, why not take that opportunity to get your heartrate up? Run, or walk, laps around your truck to get some quick cardio in. Try changing it up – jog for two minutes and walk for five. Find the right cardio combination for you so you can stay active, even when you’re spending time on the road. 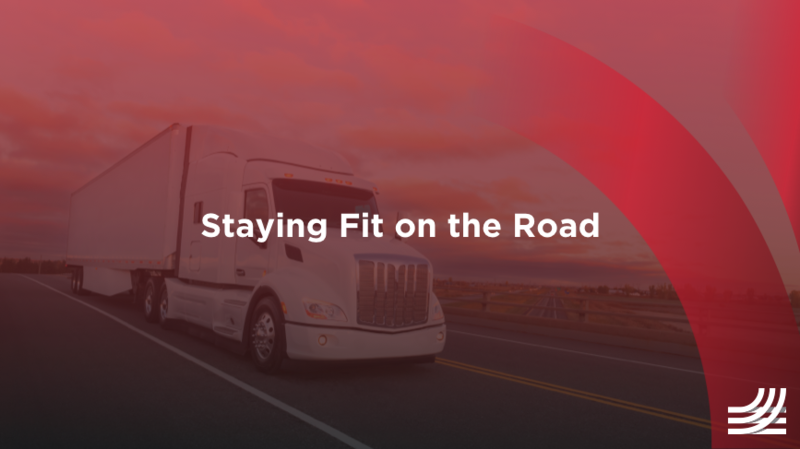 There’s no doubt about it, exercising is important, and with these tips, you won’t have any excuses not to exercise on the road. It’s a great way to stay in shape and burn off some of the excess energy you gain while on the road. Contact US Transport to see how we can help you be the best driver you can be!